I’d suggest that the punditry on BT Sport on European nights is as good as anything on tele nowadays, including Sky Sports’ much revered Monday Night Football. 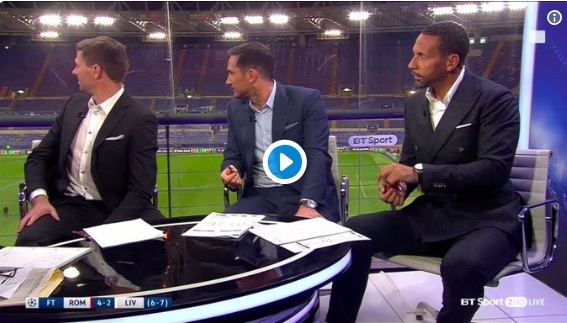 Last night, it was exquisite, with the always excellent Steven Gerrard joined by two players that used to be enemies of Liverpool but are undeniably good lads: Frank Lampard and Rio Ferdinand. In this piece of post-match analysis, which we’d advise watching all of, the trio discuss Liverpool’s progression to the Champions League Final. Our favourite segment comes at 1:18, when Lampard lauds James Milner for the Englishman’s phenomenal performances throughout Liverpool’s European campaign. “He’s boring because he trains so hard – all the hours, all the gym-work – for these moments,” he concludes. And he’s right. Milner is 32-years-old, teetotal, and still Liverpool’s fittest player. His nine assists in the Champions League this term is the most of any player in the competition’s history. "He's 'boring' because he trains so hard for these moments." "As a Man Utd fan, Man Utd ex-player, it's frightening. This could be the start."